When targeting the media it is important to get your press release right or it will be straight in the bin. The main thing you need to do is grab the journalist’s attention, once you’ve done that, if you have a news-worthy story, then it is likely that they will be interested. Of course the first part of your press release that anyone reads is going to be the title; it has to catch attention whilst giving the reader a bit of an idea to your story. Think about how newspaper titles are written, bold, attention grabbing headlines that give you just enough insight into the story that you want to read on. This is the sort of title you need although try not to make it too ambiguous or vague. The first few lines after your title should explain more about the story so the reader can get a good idea of what it is about. The rest of this first paragraph should explain the who, what, when, where, why and how so the reader will know exactly what news is being communicated as well as all the main details and key players. The rest of the press release should elaborate on what you’ve gone over in the first paragraph, try and insert quotes from key people involved, give all the important facts and figures and make sure that the journalist reading could turn it into a full news story without coming back to you for more information. It is likely that the journalist will contact you for extra information but from time to time when a deadline is approaching or there is a need for content quickly then they might run the press release as it was sent to them. You need to make sure that everything is spell checked, formatted correctly and that you are happy with how it looks and reads. It is also a good idea to keep your press release to around 400 words, the reason for this being that journalists have to read a lot of press releases every day so they certainly won’t have the patience to read page after page of information. If you have a lot to talk about and find that you need to go over 400 words then try not to make the press release any longer than one page in word at size 12 font. The contact details of the person who can elaborate on the news story and provide journalists with more information should be at the bottom of the press release. These details should include, full name, position within the company, telephone and email address. If you have multiple pages or other documents to send with the press release then put your contact details in the footer of every page so if someone needs to get in contact then they don’t have to scroll too far to find that information. 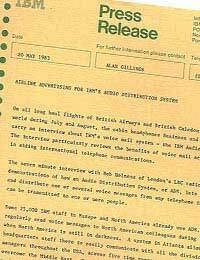 It is important to put at the top of the release ‘For immediate release’ then below that the date, and the name of the company it is involving. If you want to add pictures to your press release then you’ll need to find an eye catching picture that is small in size so it doesn’t take the journalist an age to download your document. You might also want to have two press releases one with an image and one without, this way you can make sure that you don’t send pictures to journalists that specifically ask for text only. Ensure you have the details of your event clearly on the page so when the journalist scans it they know exactly what is happening and where.